The Royal GeelongShow is over for another year and while there are still plenty of projects on foot, there are no pressing deadlines at the moment, so it’s a good time to stop, tidy the studio, take stock(of the stash and the ideas) and think about what might be next. I finished 2 of the 4 entries I had planned for the Geelong Show, so feeling a recurring theme here. One was my first attempt at weaving with handspun. 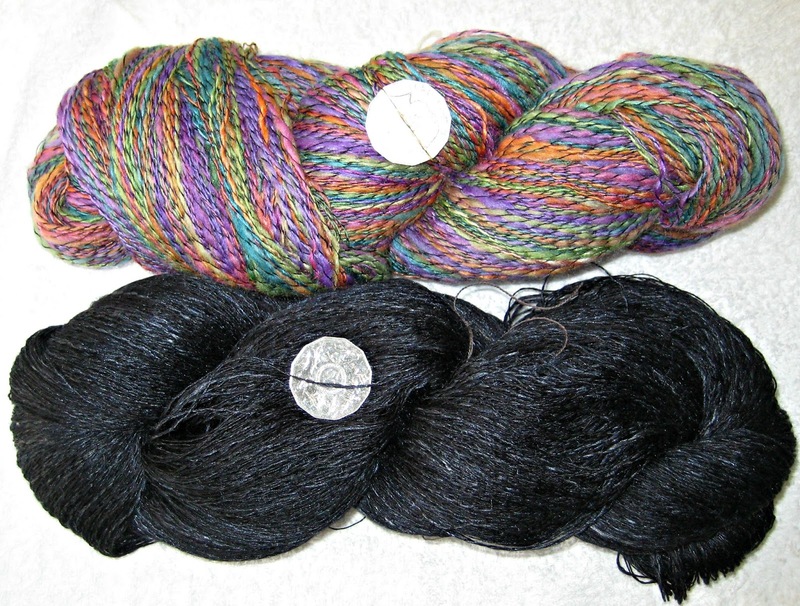 I had a braid of wool, silk and angora bunny from Charley, spun finely and plied with some very fine silk. The contrast was an 85/15 Merino/silk blend, again plied with the fine silk. 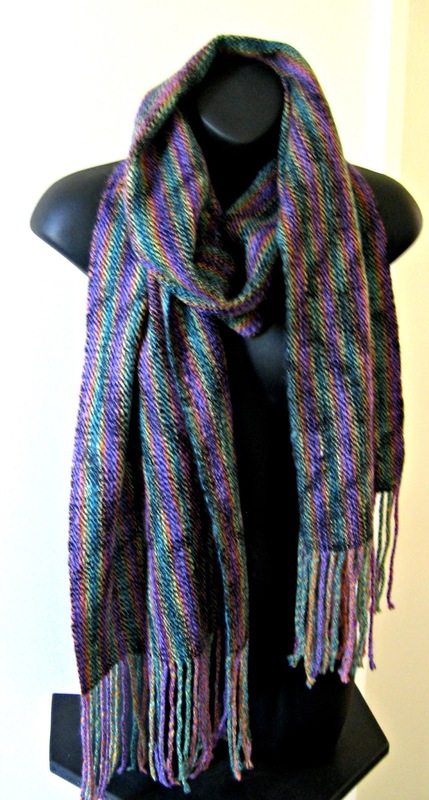 The yarns behaved perfectly, better than some store bought ones I have used. There were no broken ends, shredded warps or other problems. 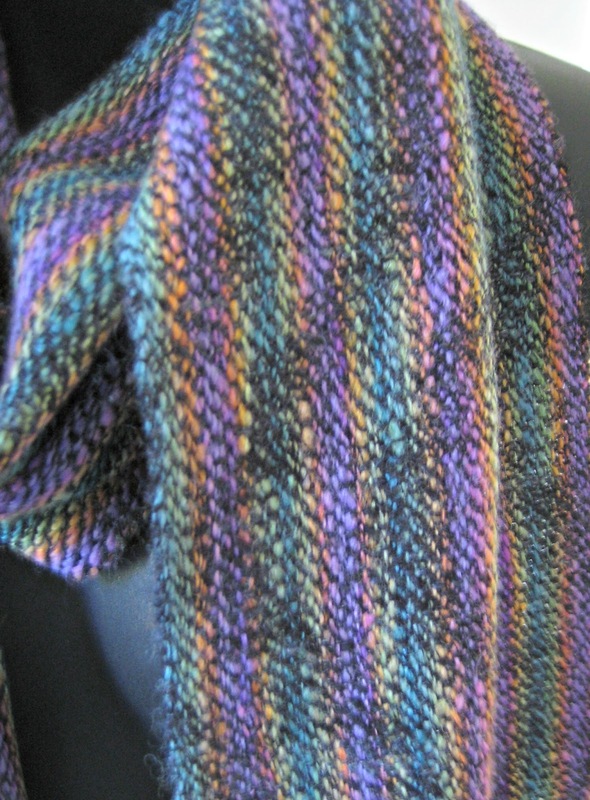 I used an advancing twill and there was a bit of a conflict between the stripes in the warp and the advancing twill. In some lights the twill is hardly visible but when there is less light it just pops out. I'm not sure whether I should have spun the weft thicker, used it double or chosen a braid with less contrast in it - maybe a bit of all three. 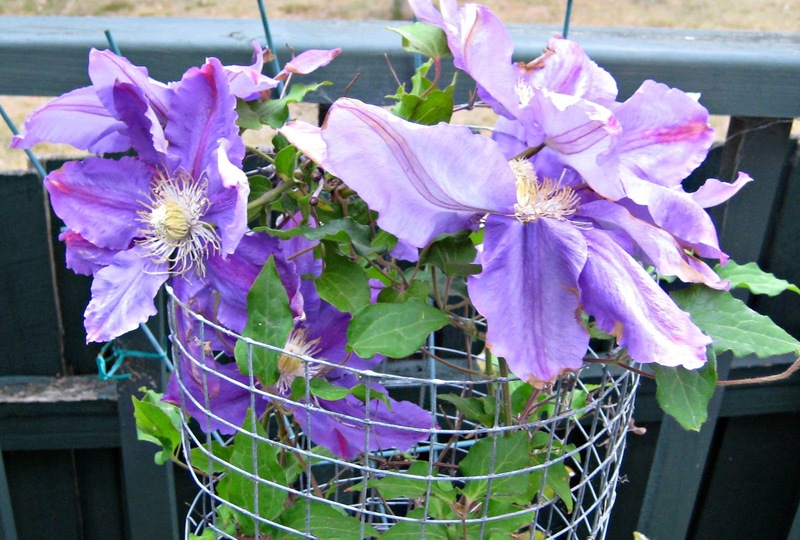 The handle is great and the judges gave it a second prize and the E Marion Long Memorial Award for the best exhibit using a variety of colours – thanks Charley! The other entry was a narrow silk scarf in huck lace. 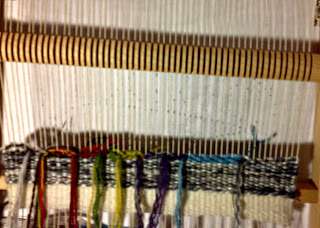 I had a nice hank of mulberry silk, planned the warp and weft using the measurements on the label but at the last moment, just before I wound the warp decided I should do a rough measure – length of hank x number of ends. Imagine my surprise when instead of the 1200 metres I thought I had, there were only about 550 metres. It was back to the calculator, fortunately as the yarn was thicker I didn’t need so many ends to the inch and I ended up with some left over as I had made the warp a little on the short side. 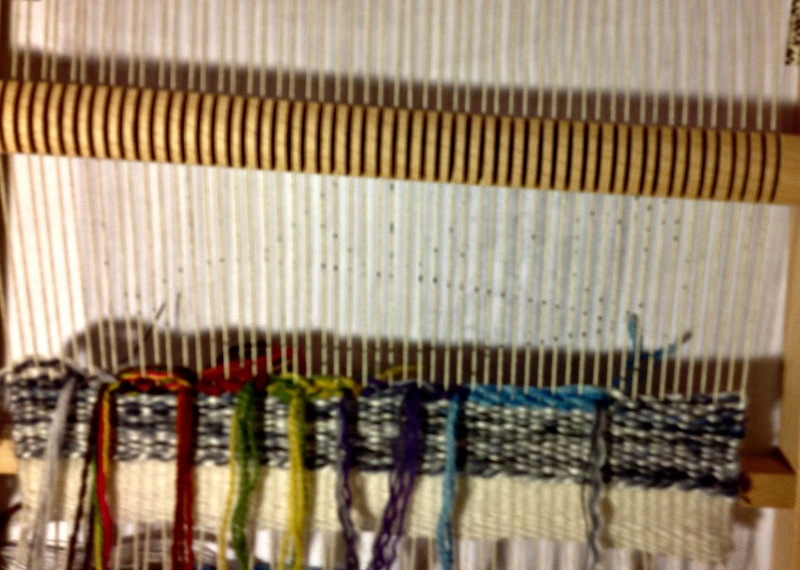 Fortunately with the Toika loom there is only about 12 inches of waste at the end, or 12 inches minus the fringe. I’m in the process of putting a warp for a cotton scarf on to the Toika loom. The warp has been maturing in the stash since at least 1999 and cross has been mislaid along the way. Next after restoring the cross, will be a run of tea towels for the next market, the last for the year and for Christmas presents. 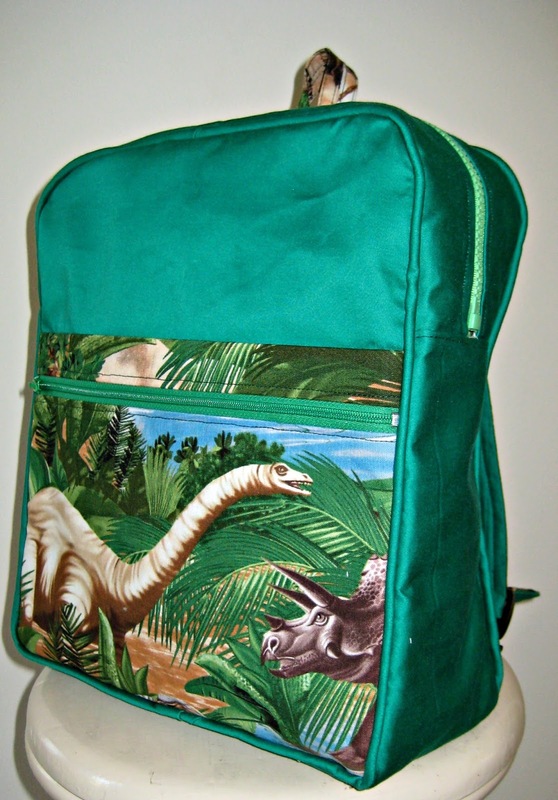 I’ve also finished the backpack from leftover fabric, and got it into the mail today, that’s a good feeling. I was surprised how much work there was getting all the straps, tags and pockets made but once that was done it went together very quickly. Congratulations on the awards, well deserved. Now that you've had practise tidying how about coming over here and working on my room? I can't move in it! !